View these costumes, and all the other entries under the 2011 Hallows End Costume Contest page. I want to thank all of contestants for their entry(s). Thank you for participating! This year is the last year for this beloved contest. 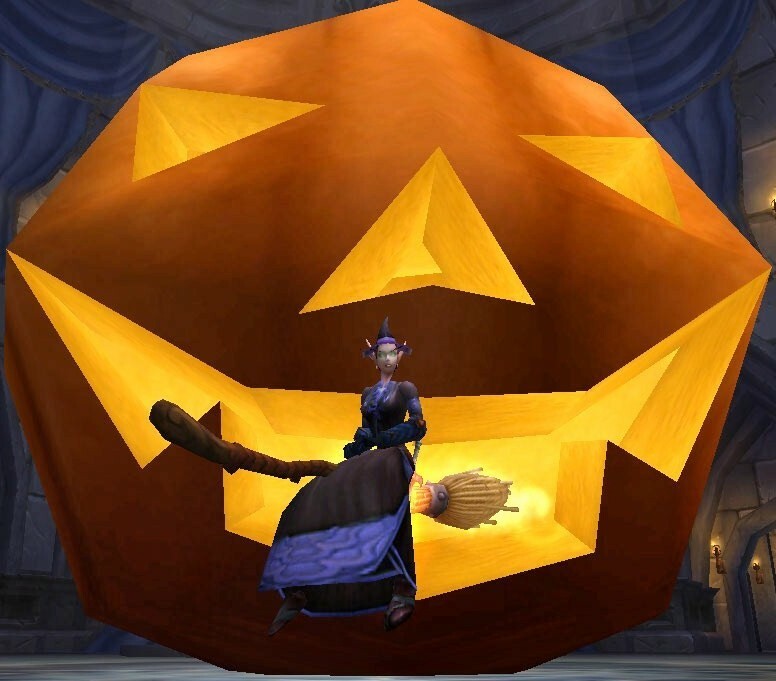 This has been a much anticipated part of my Hallow’s End in-game, and RL Halloween, for the past 4 years (I can’t believe it has been that long!). However, as my life and time schedule is moving away from being able to dedicate as much time as I did before for this site, I feel it is for the best that start to move away from this tradition. I hope to replace it with Transmog-able challenges (which was a great suggestion by one of my readers months ago) to bring more traffic to the Kirina’s Closet Forum. I haven’t decided on the prizes yet, possibly just bragging rights or some small token of appreciation. Let me know what some of your ideas are for these challenges. Some of my ideas are cooking/fishing outfits, NPC look-a-like, and even challenges that make you base an entire outfit around a specific piece of gear. I haven’t been doing much lately with my site, especially these last couple of months, because I’ve been so BUSY with work. Who would have thought being a teacher would eat up so much free time? lol >.< Good thing the semester ends at the end of this week! Another thing that ends this week is what this post is for. Chatmay, over at the WoW Debutante, has been hosting a Transmog Fashion Contest this month. The only thing you have to do is comment on her post who you think should win, and, you’ll have a chance to win something, too! I would vote myself, but well, I’m a contestant. ^_^ The contest is between myself, Kamalia from Kamalia et alia, and Effraeti from Effraeti’s RP. Check out the contest and vote! In other news, hopefully with the holiday I’ll get some new content up on this site. I know I’ve said that before….oh well, I’m sorry lol. Over this Thanksgiving break, WoWInsider featured Kirina’s Closet on their “15 minutes of fame” section! I was so honored to be interviewed by them, and, I love that they even asked me about my WoW knitting. More importantly though, tomorrow is the 29th – the end of PvP season 10. Will tomorrow be 4.3 day, as well? I’m waking up early to find out. Hopefully, though, it’ll be next week Tuesday…more in line with the Darkmoon Faire schedule (^_^). I am also happy to see that they finally added recipes for Rhinestone Sunglasses and the High Society Top Hat to be available in-game once 4.3 hits. It’ll be awesome for clothies if we can transmog these! View these costumes, and all the other entries under the 2011 Hallows End Costume Contest page. This year, Waddell and I had help from a couple of volunteer judges who have been long time readers of this site – Kamalia and Hyacintha. Even with two extra people in the decision making, we all had a hard time narrowing down the entries to the final winners…and you all made it even harder this year with almost twice the amount of entries as last year, and, by raising the bar with the quality/creativity of the costumes! Something different that I included this year were “Honorable Mention” costumes. These were the costumes that were a part of each judge’s top 10 picks…the ones that the final vote came down between. Last year, I saw an influx of posts on the forums asking about the items that contestants used in the costumes that they submitted – even for those that did not win a prize. So, if your costume didn’t win, please know that your idea(s) still inspire someone else because they are still creative and unique! I’m sure I’ll get requests asking for the outfit pieces of a lot of costumes submitted…especially the ones that look like NPCs. I want to thank all of contestants for their entry(s). Thank you for participating!